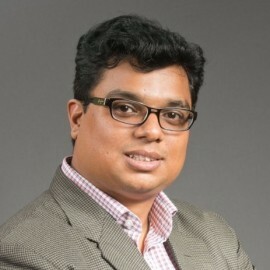 Abhishek Shukla leads the team focused on finding investment opportunities in Industrial Internet (IIoT), Cloud, Cybersecurity, Big Data/ Analytics, Artificial Intelligence and other technologies associated with GE Digital portfolio. Prior to joining GE Ventures, Abhishek was a member of Cisco’s Corporate Development & Ventures Investments team leading Security and Services portfolio and was involved in multiple acquisitions & investments. In his earlier career, Abhishek has held leadership positions in M&A, Strategy and Sales in Agilent, Sony and SAP while living and working in Singapore, Malaysia, Hong Kong, India and the US. Abhishek holds a Bachelor’s degree in Electronics & Communications engineering from Delhi College of Engineering (DCE) and a MBA from Haas School of Business, UC Berkeley.